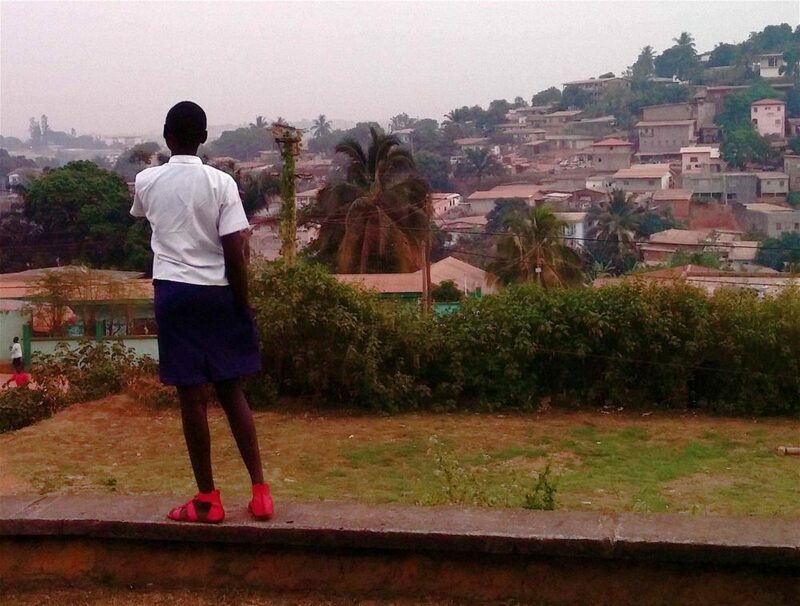 In January 2015, I went to Cameroon to produce an art project in response to an international artist call. The purpose of the project was to create an exhibit using Archive Photos from Buea, Cameroon, digitized by African Photography Initiatives. However, my driving motivation was to work with a marginalized sector of Cameroon’s society – girls orphaned due to AIDS. I joined with African Action on AIDS, a small NGO in Yaoundé that sponsors the education of 25 orphan girls ages 12 to 22. The project received funding from the US Embassy in Yaoundé because of its girls’ empowerment component. The outcome of this project was an audio/visual installation that looks at the role of women in Cameroon through the eyes of girls supported by African Action on AIDS. The process involved showing Archive Photos to the girls, encouraging them to give their interpretation of the photos, and recording what they said. Their words became a new version of Cameroon’s past, present, and future. 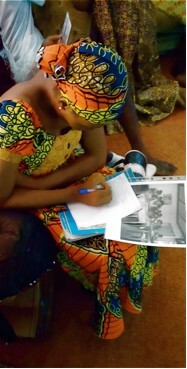 Collaged panels of the photos, accompanied by recordings of the girls, were exhibited at the Validating Visual Heritage in Africa conference in Buea in January 2015. Once I returned to the US, there was time to listen more closely to the audio. Since most of the girls spoke French, I worked with a translator to better understand their narratives. They made statements like: “Today we are girls, tomorrow we will become women, but to be women of tomorrow we must be free, independent, autonomous.” Many expressed the desire for an education in order to do something productive with their lives. From these girls, who have lost much, came a tremendous collective strength. The significance of what they said was astounding. I knew I had to keep going with the project. One of the girls, Soline, was recorded using her village dialect (there are over 200 dialects in Cameroon). I thought it would make an interesting hip-hop song. A musician friend connected me with a producer who was enthusiastic about putting beats behind the audio. I asked Dr. Ruth Engo, the AAA director, if Soline could translate her words. Within days, I received the translation. Her commentary described the difference between traditional dances of her village and contemporary dancing. She added that today, even though she lives in the city, she often turns to traditional dances, called Ngoukgan, as a source of comfort and leisure. Ngoukgan (the title of the track) has received overwhelmingly positive response from music industry professionals. I have been encouraged to make an album featuring recordings of the girls. That is what I intend to do. The first step is to compose “lyrics” by editing the original recordings. Next, music will be created to reflect the message of each song. It’s a long process, but it has begun. The great Senegalese filmmaker, Ousmane Sembène, said, “When women progress, society progresses.” In this spirit I move forward in compiling a hip-hop album that gives voice to girls from Cameroon. Their words, loaded with insight and determination, speak loud and clear about their potential. Through sharing what these daughters of Africa have to say, my hope is that it will help make it so for girls in Africa and everywhere, because when girls progress, the world progresses. A Kickstarter campaign will be launched to cover production expenses.